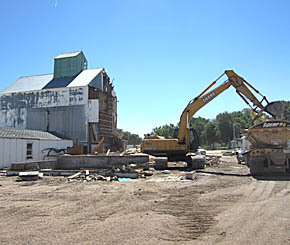 An old fertilizer plant in Petersburg was razed last week. The old plant, near the Helena Chemical Co. “dome” was no longer useful. It was taken down by Bygland Dirt Conracting on Friday, June 28. The buildings were built during the 1960s.